vehicles available in the villages also improve the public transport facility and generate employment options in rural areas. The main objective of PM Gram Parivahan Yojana is not only develop the transport in the rural areas but also government wants to bridge the gap between villages and cities where the roads have been constructed but there is no or very less public transport through this scheme. Under this scheme Govt. will provide a financial assistance in the form of an interest-free loan to the women self-help groups in rural areas on the purchase of small commercial vehicles, to boost public transport and generate employment. Under this scheme vehicle loan will provide for commercial purposes and this scheme initially take off from Bilaspur District in Chhattisgarh. 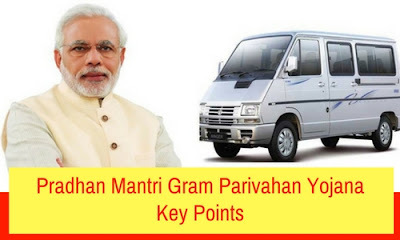 Initially Pradhan Mantri Gram Parivahan Yojana was launched by Atal Bihari Vajpayee Government in December 2000 as a massive programme to provide interest free loans for on at least 1,500 commercial vehicles in 250 blocks across the country and the maximum seating capacity of the commercial vehicle would be 10 people. In this scheme A limit of Rs 6 lakh on the loan amount will be give and the repayment period will be of about six months also an individual may earn up to Rs 6,000-9,000 per month after loan instalment is paid. The vehicle for which the loan will provide must be a commercial vehicle. The vehicle must be maximum of 10 seat. Also the vehicle must run 20- 22 kms every day. The scheme will provide interest-free loan to the women self-help group for their business purpose. Children and women will be benefited from this scheme. With the launch of this plan travel through public vehicles is turn out to be easy because previously lack of transportation leads to face lot of issues when travelling to school, or work places. The scheme will also provide opportunity for the rural people living in the rural areas for enhancing their trade and businesses. The govt. will also provide interest subsidy of 30% - 35% to the applicant. So the person has to bear only 65% of the interest amount.